Is there anyone else out there who feels they can’t leave on a trip without first cleaning the house? Because I’m one of those people. In the past, we would clean the house when we had guests coming over or when we left on a trip. 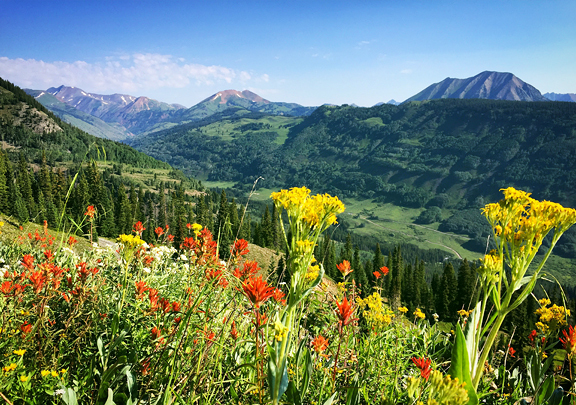 Now, because we split our time between Nederland and Crested Butte – I find myself cleaning both houses more than I ever wanted. I just hate coming home to a mess, so this is present me doing future me a favor. 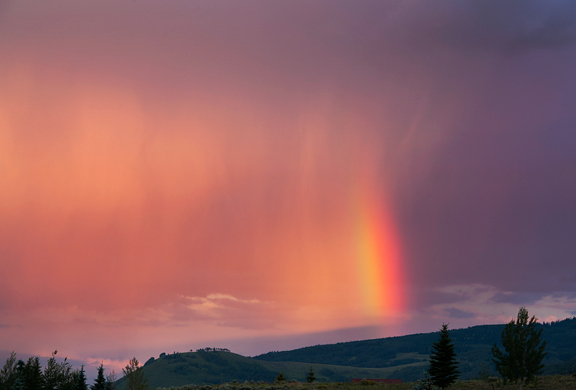 But last week after spending the whole weekend in hunter education and then coming home to do laundry, clean house, and pack for Crested Butte – it was a miracle that we were able to leave at all. In fact, I didn’t think we were ever going to get out of our neighborhood because we went back to the house three times for four different things we had forgotten, but remembered just as we headed down the street. On our latest trail run, I decided to get a little more climbing in and ran the same route as Jeremy – just slower and not as far. My goal was to reach the first basin and turn around, but because Jeremy and I have different ideas of what a stream crossing is, I ran up out of the basin thinking the NEXT basin was my target until I met Jeremy as he was running down. Well, I’m glad I did because I saw a black bear on my climb! We only ever catch glimpses of black bears, mainly because they don’t want any trouble and are quick to avoid people. In addition to the bear sighting, I heard a couple of grouse, ate some wild raspberries and wild strawberries (so good! ), and stopped to admire the wildflowers and views. 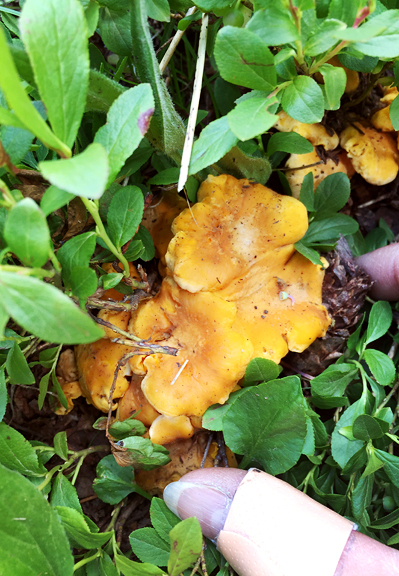 Foraging and trail running are two things we generally try to avoid doing with Neva. On those days, we’ll take her for a fetch session or a bike ride – something high energy and fun, but quick. And then days like today, we’ll take a rest morning and make it all about Neva. 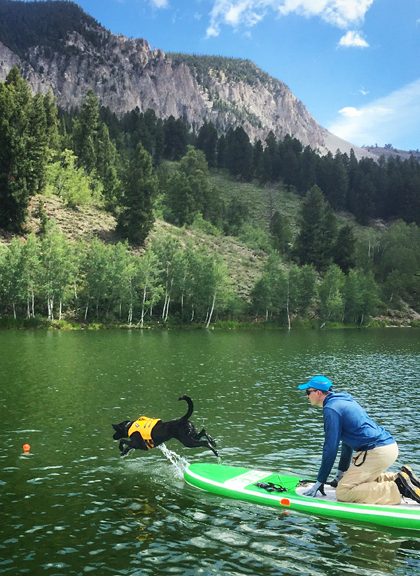 She got to fetch and swim at the lake, go for a hike, fetch and swim some more, go paddling – which involves more swim-fetch, and then a few more fetches while Jeremy packed up the paddle boards. You don’t think she’s spoiled, do you? Two weeks ago, I had my parents come up to my house to make and shoot a couple of their recipes with me. A week prior, I had tasked them with writing up the recipes and emailing them to me so I could review the recipes and plan the shopping list. As some of you may recall, my parents don’t use “recipes”. Mom is far more obliging than Dad and will give it her best effort when translating a dish into writing. Dad is practically a lost cause because he’ll write down a recipe, all the while declaring that he doesn’t NEED a recipe, and then proceed to change it twenty different ways *while* you are cooking according to said recipe. I know this is payback for my teenage years. Today’s recipe is a crunchy, refreshing salad that my mom likes to make in summer. I am totally hooked on it and when the days are hot, I could eat a whole batch in one sitting for dinner. 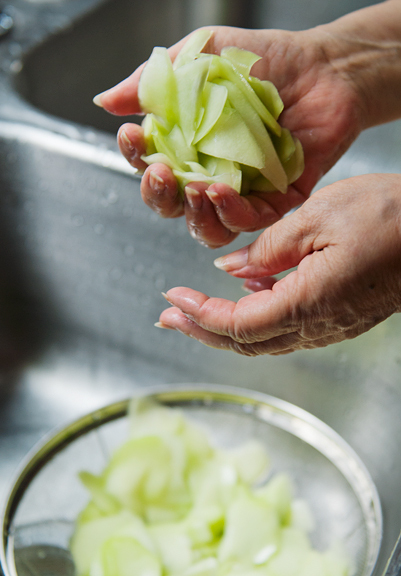 Buddha’s hand melon, also known as chayote, is a vegetable that you can eat raw or cooked. I’ve always seen them in the Asian markets, but never knew what to do with them. 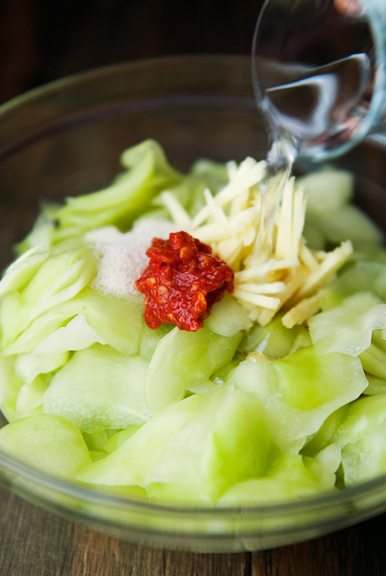 Mom’s preparation involves salting the sliced melon, and then tossing it with a sweet and sour dressing. Simple. First, you’ll need to peel the outer skin off the melons. 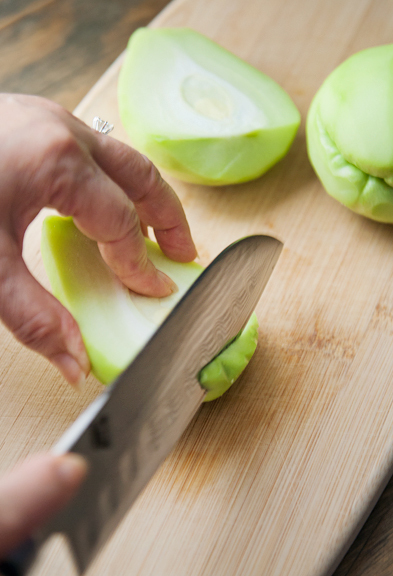 You can use a sharp knife or a potato peeler. They can get slippery, so do watch your fingers! 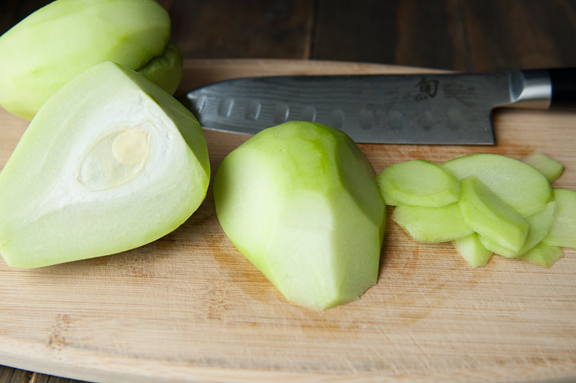 Don’t worry about peeling the bottoms as you’ll trim those after you slice the melons in half. The core of the melon is tougher than the meat of the melon, so we slice the melon around the core. 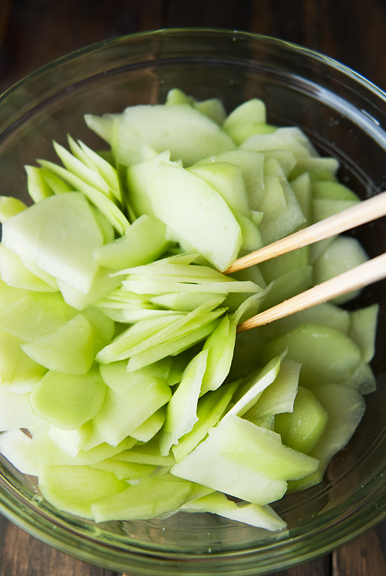 Once you have all of your slicing done, place the melon in a large bowl and sprinkle the salt over the slices. Toss the slices in the salt to ensure a good distribution, then let it sit for an hour at room temperature. The salt is going to draw liquid from the melon as well as season the melon. 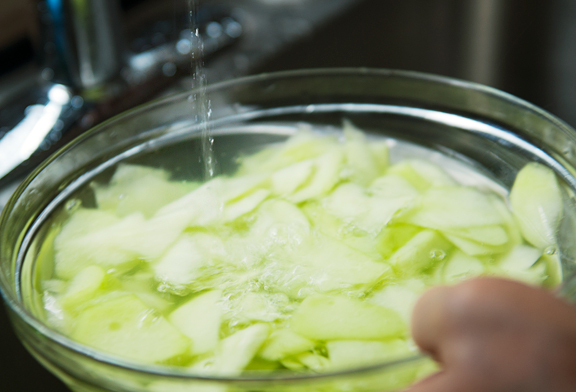 Rinse the melon slices under cold water, then drain them in a colander. After you squeeze as much liquid from the melon as you can, taste one of the slices. If it isn’t salty enough, you can adjust the seasoning when you add the dressing. 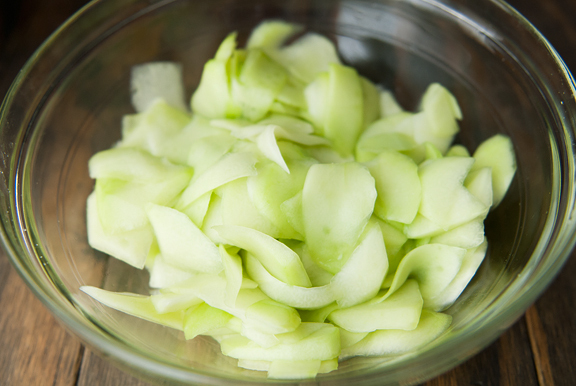 Once the melon slices are ready, you can toss them together with the dressing ingredients. And you can vary the amounts or the ingredients to your liking, so be sure to taste and adjust accordingly. The salad tastes fine right after you mix it, but I think it benefits from sitting in the refrigerator for another hour or so to let the flavors meld. 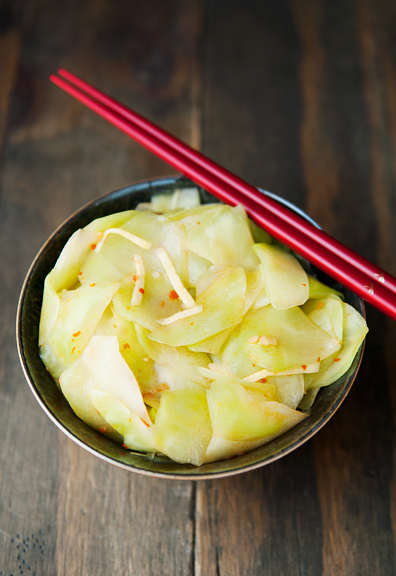 This Buddha’s hand melon salad is a lot like Asian pickled cucumbers, but I find the texture to be crunchier (which I like) and the mild flavor a nice change from the usual salads. Raw ginger lends a bright zip to the vegetable and while the chili garlic paste is optional, I highly recommend it to round out the sweet, sour, and earthy components. I’m putting the salad into heavy rotation at least until the weather cools down. Best of all, when I eat this dish, it feels like I’m eating Mom’s cooking. There’s really nothing better. 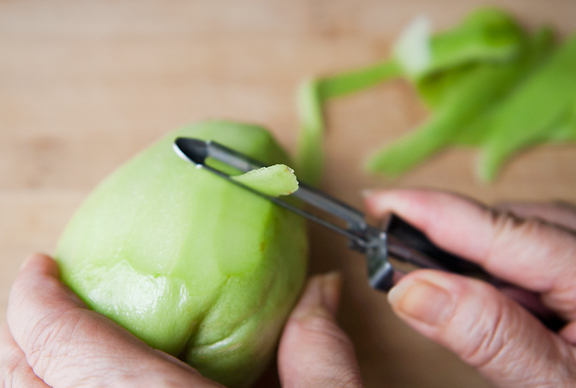 Peel the outer skin off the melons, then carefully slice each melon in half lengthwise along the bottom crease. 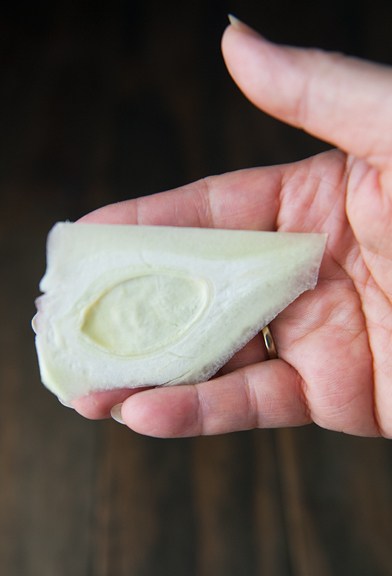 Trim any remaining skin with a knife. Cut each half into thin petal-shaped slices, cutting around the hard center. Discard the centers. 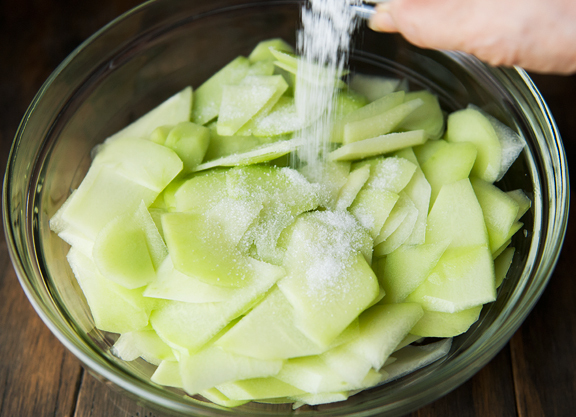 Place all of the slices into a large bowl and sprinkle the salt over the melon. Toss well and let sit for an hour. Fill the bowl with cold water and swish the melon slices around. Pour into a colander and drain off the water. Grab a handful of the slices at a time and squeeze the excess liquid out. Place the squeezed slices in a large bowl. 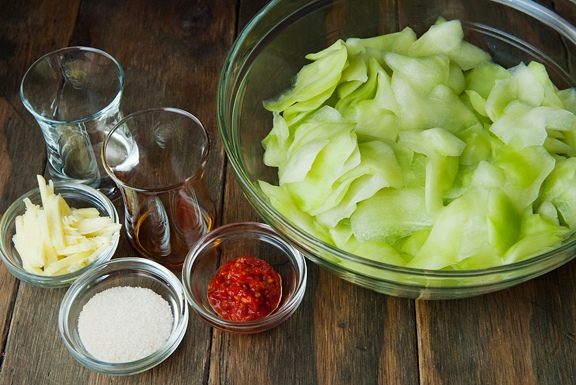 Add the vinegar, sugar, ginger, sesame oil, and if using, the chili garlic paste to the melon. Mix well and refrigerate for an hour before serving. Serves 4 as a side dish. Haha, I know exactly what you mean. I just spent more than 3 days rearranging, fixing and cleaning the house because we will be away for half a year and someone else will move in. The house hasn’t been this organised and clean for a while. Heading to Boulder of all places and I am looking forward to explore those fantastic mountains that you keep posting photos of. I love all pickled vegetables so this is a recipe I have to try. Keep posting! I love that you have captured these moments cooking with your mom. I remember reading the posts where you spent time cooking/eating with your grandma. Those were so sweet! I can’t wait to try this salad. I love to try new vegetables. 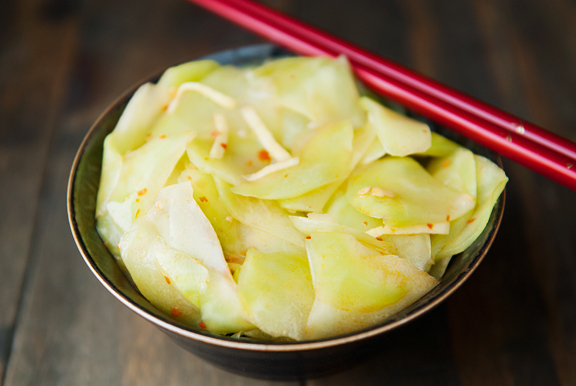 Just a few days ago we were served a chayote salad as a side dish at a Korean restaurant and it was crunchy, tangy and delicious. Before that, I had only eaten it cooked in the Mexican beef soup called “caldo de res”. Your outdoor photos in this post are gorgeous. Thanks for posting this. The photos are great! I can no longer hike but this makes me feel as if I am right there too. I developed a lot of allergies so cannot eat out at Chinese, Japanese, Vietnamese restaurants. I am going to try to learn basic dishes I can make at home so I can enjoy it again. The Buddha’s hand melon looks interesting. thanks! I love trying new veggies and am always on the look out for things to do with them. 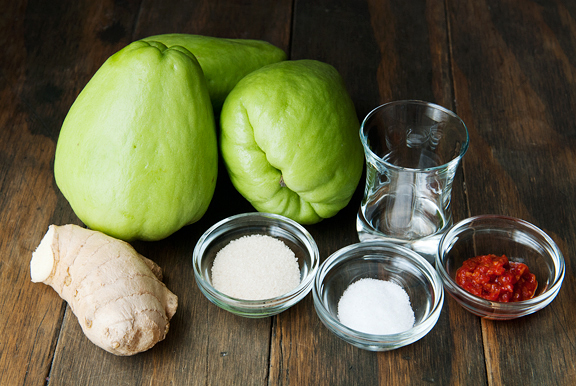 I have never tried Chayote, but have always wanted to and now I have a special recipe to use thanks to you and your mom! This looks fantastic and I can’t wait to try it. Your smart for getting your mom and dad to write their recipes down, they’re priceless. And yes, Neva may be a little spoiled and good for her! she’s one lucky pup and what a day! 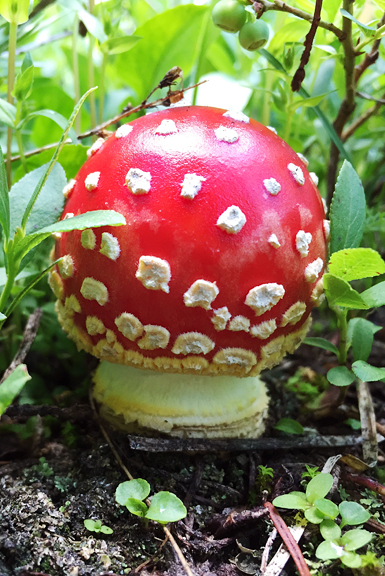 Nice shroom shots…. Beautiful mushrooms! Spoiled puppies! Gorgeous flowers. So many beautiful photos! Lovely cooking stories. Your posts are always so welcome. I’m sure you’re told this a lot but I really feel like I “know you” from your posts as you’re able to welcome us into your life with your writing. Please don’t stop. I can’t wait to try this salad – it looks so crunchy and refreshing. 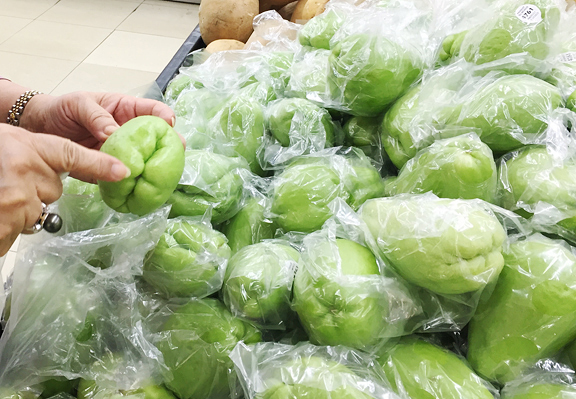 Chayote is a new vegetable for me, too. I need to find one of those! I can’t wait to try this salad! My parents have a similar version with garlic, salt, and rice vinegar but this sounds like a great spicy alternative! In Australia, we call that a ‘choko’ and everyone had a vine in the back yard somewhere. 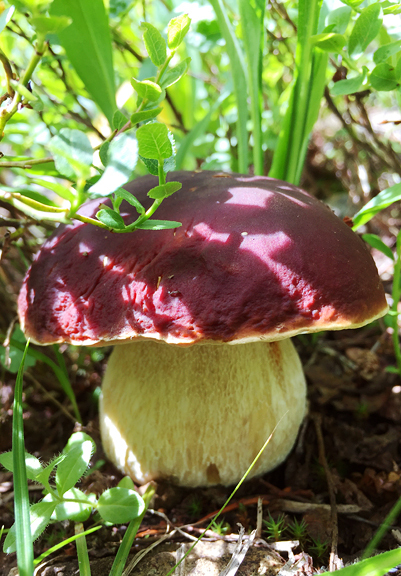 They grow like crazy and were a Depression-era favourite because they are so prolific. Unfortunately, my grandparents and parents steamed or boiled them into unappealing mush. Much nicer raw in a crab salad! Just let a choko sit in a cupboard for a bit and you’ll come back to tendrils everywhere and then you can plant it. Going to try your recipe when it is summer here. I live in Bellingham, WA, a great place to live…usually. I have a month off starting the 19th (I teach chemistry at the community college here) and was planning on doing several long hikes in Washington State but the smoke from Canada and the ongoing forest fires here is causing me to have to rethink my plans. I am thinking I might head down and hike the Teton Crest Trail and then maybe head down to Colorado. Crested Butte has always seemed so beautiful in your photos, I was wondering if there are any longer loops (40-60 miles) or shorter hikes (a couple of nights out) that you could suggest in that area. 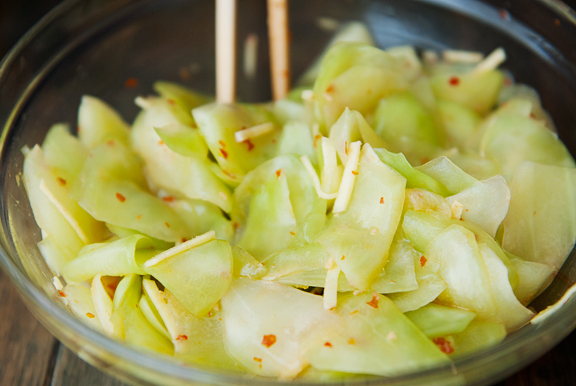 So happy to find chayote dish. My friend has it in the garden and now and then I get some fruits so this is one another beauty to try ! Thank you so much ! SKA – I think this is right up your alley! Corine – How awesome! I hope you enjoy your stay in Boulder and feel free to email me if you have any questions! Ellie’s friend – Glad that the photos can take you there! Amanda – You are incredibly sweet, thank you xo. I hope you like the salad! Grace – Oh yum, I may try it that way, too! Jill – More exciting than scary (only for a brief second). Bears are usually keen on not being bothered by people, but I do love seeing them! And yeah, I hate coming home to a messy house! Monique – Hmmm, there are a lot of hikes in the area and you can certainly link several together, but the only one I have done is the four-pass loop between Crested Butte and Aspen and it’s only like 24 miles or so. The trail condition isn’t as nice as the trails on the Front Range (Indian Peaks Wilderness/Rocky Mountain NP), but it is definitely wilder. 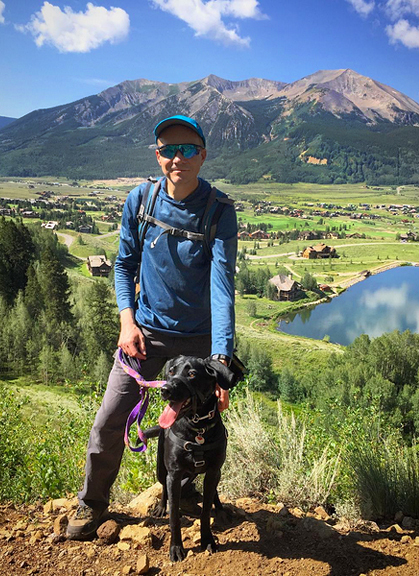 Your best bet might be to grab some topo maps and have a looksee at the trails in the West Elk Mountains and the Elk Mountains. But seriously, almost anywhere in the western half of Colorado is beautiful for a backpack! You can email me if you have specific questions. Made this tonight and it was deeeelish- thanks for sharing, Jen! Thanks for the recipe. We have a lot of this where I live and I never thought of making it a salad.